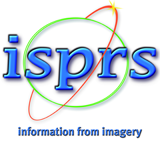 The 14th Conference on Location Based Services will be held at the Main Building of ETH Zurich, Switzerland. On this site you will find the address as well as information about hotels and restaurants. The ETH Zurich Zentrum campus with its historic Main Building not only embodies the university’s traditional roots but is also a lively centre for socializing and study. Please take a look at the following information on various hotels near the conference location (in alphabetical order). We advise you to book your room early as only a limited number of rooms is available with a guaranteed conference rate until mid December. Some of the business hotels are closed from Christmas until the beginning of January 2018. Special room rate until 15.12.2017 – please send an email to info@hotelbristol.ch mentioning the code LBS2018. Hotel Bristol, at the heart of Zurich, is the ideal base for exploring this fascinating city and its idyllic surroundings. Millions of guests visit the small yet exquisite cosmopolitan city which offers a huge range of cultural, shopping and relaxation activities. 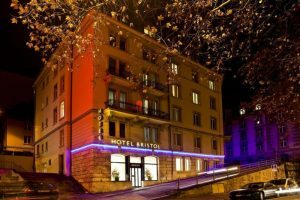 The Bristol, in its smart neo-classical style, is located in the center, just a few minutes’ walk from the main station, the old town and the Bahnhofstrasse shopping street. Despite its central location, the Bristol enjoys a relatively peaceful location. Our international clientele appreciates the modern, comfortably furnished rooms with their good price-performance ratio. (http://hotelbristol.ch for more details). All rooms including breakfast, excluding City Tax (CHF 2.50 per person and night). Triple and family rooms on request. Please download and fill in the reservation form and book before 18 December as the hotel is closing for Christmas. 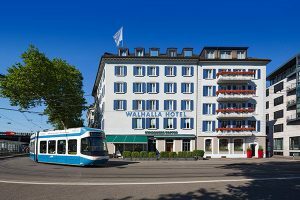 The Hotel Coronado is located by the tram and bus stop “Milchbuck”, where you have direct connections to the ETH Campus (10 min), the center and the airport of Zurich (20 min). If you arrive by car, there are free parking spaces during your stay. All rooms are equipped with a comfortable box spring bed, an own bathroom, a television, free WIFI internet, a work desk, a fridge and a bottle of mineral water for free (http://www.welcomehotels.ch/en/coronado for more details). Special room rate with the code LBS2018. Book on http://www.hotel-krone.ch/en/default.html. 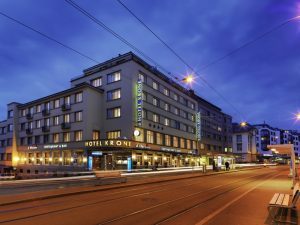 The 4-star Hotel Krone in Zurich Unterstrass is a modern city and business hotel with tradition. Top quality, sustainability, outstanding service and hospitality are our core values. Our city hotel was founded in 1720 and has been one of Zurich’s most renowned places to stay ever since. Fully renovated and equipped with the very latest services, the hotel offers all the amenities that the discerning guest who wants only the best would require. Ideally located in a fashionable part of the city, our hotel is just a few minutes away from Zurich’s main railway station, the conference center, the Hallenstadion multi-purpose facility, the Zurich exhibition grounds, the university and the ETH Swiss Federal Institute of Technology. The ‘Kronenstrasse’ tram stop is just in front of our door. The journey to and from Zurich Airport takes just 20 minutes. Zurich’s sights, such as the historic town center, the Grossmünster (Great Minister), the Bahnhofstrasse main street and Lake Zurich, are just a comfortable five or ten minutes away. Special room rate with the code LBS 2018. For reservations please contact the hotel by email (info.zurich@leonardo-hotels.com) or phone (+41 44 360 12 00). 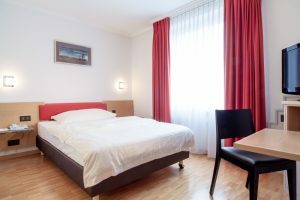 The 4 star hotel in Bauhaus style offers 67 rooms, one restaurant as well as one bar and is convenient located, only 2 tram stations or 10 minutes of walking from the ETH main building. The city center and the lake can be easily reached by tram. 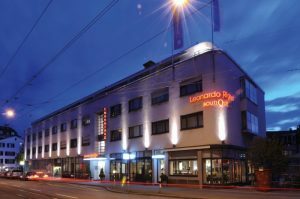 Guests arriving at the airport or at the main train station can take tram 10 which takes them directly to the Rigihof (https://www.leonardo-hotels.com/leonardo-boutique-hotel-rigihof-zurich for details). Special room rate with the code LBS2018. Book on http://www.leoneck.ch/en/rooms. 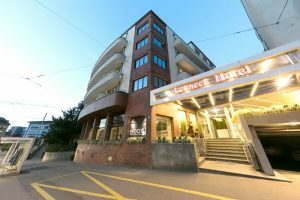 The Leoneck Swiss Hotel is decorated in a fancy ethnic design. Our modern 81 non-smoking rooms have air-conditioning and are all equipped with bath or shower. The soundproofed windows allow you a good nights’ sleep and leave the sound of the city outside, even in this central location. The rooms also have a kettle with tea and coffee selection. More recently we equipped all our rooms with a tablet PCs that will help you to learn more about the hotel and to experience the city and Switzerland. Special room rate with the code LBS2018. 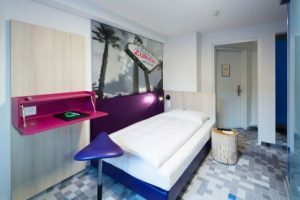 Book on https://sorellhotels.com/en/rex/zuerich. 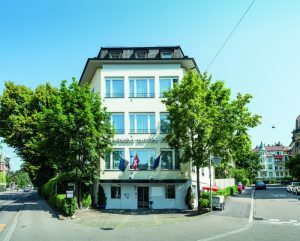 A part of the Sorell hotel chain, Sorell Hotel Rex Zurich offers particularly good value for money. This business hotel is in a central location in the university district. Zurich’s central rail station, the world-famous Bahnhofstrasse shopping district, and the financial district are all just a few minutes’ walk away. The nearby district of Niederdorf can be reached by foot or via the historic Polybahn funicular. Niederdorf is home to countless restaurants and bars and is perfect for a stroll before or after. The Hotel Rex is known for its casual atmosphere. Special room rate with the code LBS2018. Book on https://gc.synxis.com/?Chain=5375&Hotel=57035&locale=en-GB. Our modern and comfortable rooms are all equipped with a bath and shower, and the windows have been sound-proofed to give you peace and quiet at night. If you suffer from allergies we are happy to provide you with a suitably furnished room on request (http://www.walhalla-hotel.ch/en/welcome for details). Special room rate with the code LBS2018. Book on http://www.walhalla-hotel.ch/en/the-walhalla-guest-house/book-our-guest-house-in-zurich. Our two-star guest house is an affordable alternative to the luxurious rooms and comprehensive service of the three-star Walhalla Hotel 50 meters down the road. All rooms are equipped with a shower cubicle and toilet, as well as a direct dial telephone and flat-screen television. Sound-proofed windows make sure you have peace and quiet at night. The shop@walhalla next to reception is open around the clock for drinks, snacks and souvenirs (http://www.walhalla-hotel.ch/en/the-walhalla-guest-house for details).